Timeless modern, small aluminum table lamp with adjustable lamp arms and light shade with counterweight. Delivery without recommended 1 x 20 W QT9 halogen bulb, socket G4. 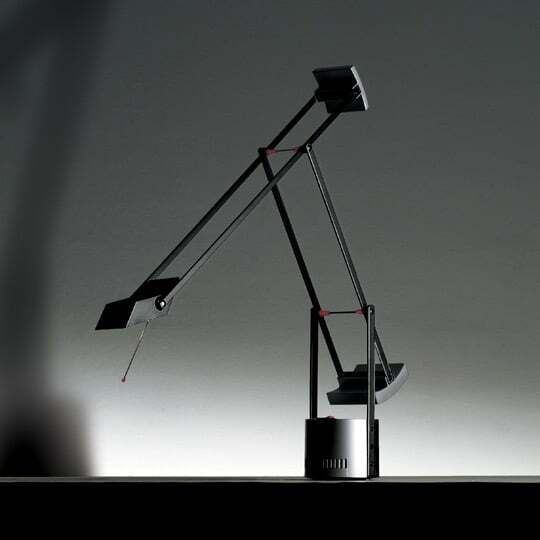 Fully adjustable, balanced, electrical conductor arms, head and counterweights in painted aluminum. The innovation lies in the basic concept: the base incorporates a low voltage transformer that supplies through small rods and buttons a halogen bulb, that in addition to its structural function also acts as a conductor so no cable is necessary. direct adjustable light emission in two intensities. Artemide is one of the most known illumination brands in the world. Known for its Human Light philosophy - Artemide understands light as a human companion and the source of physical and emotional well-being -, the brand Artemide ist synonym with design and innovation made in Italy. Do you have a question about "Tizio Micro"? How can we contact you?